The most important feature of any space is its capacity, especially in the world of computers because here the storage capacity is a matter of prime concern because of it being in a never-enough state. The Google-owned blogging platform Blogger gives the free user a total of 1GB of storage space for the multimedia on their blogs. It seems decent at the start, but eventually gets eaten up pretty fast and after it's done with, you may need to buy more which doesn't sound easy. However, by restricting yourself a bit, you can actually make this 1GB storage space last forever. Let's take a look at how this can be done. Blogger uses the Picasa Web Albums to store the multimedia on your blog. You can even view that content from there. If you're familiar with the Picasa limits, you might already got the idea of what i'm talking about, but well i'm gonna lay it down anyways. Some Google official clearly explained the trick recently on their support forums. Picasa Web Albums offers 1 GB of free storage for photos and videos. However, files under certain size limits don’t count towards this free storage limit. This applies to uploads for other Google product that store photos and videos in Picasa Web Albums, including Blogger, Google+ and Google Maps. Photos up to 800 x 800 pixels and videos up to 15 minutes won’t count towards your free storage. The deductions from that piece of text are that all the images of 800x800 or lesser resolution and all the videos of length 15 minutes or lesser are never counted in the Blogger storage space. You can upload infinite multimedia fitting this criterion and your free space would not get affected. So the next time you upload images, make sure they satisfy this criteria unless of course if they are meant to be uploaded in a higher resolution. 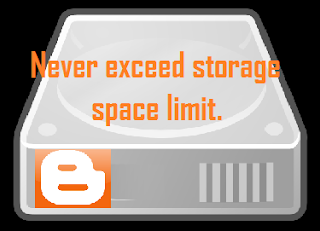 This method, which is also totally legal, makes you never run out of the default Blogger storage space limit.